We’ve all felt that creepy sensation when you could swear there’s someone right behind you even though you are, in fact, alone. The sensation is known as “feeling of a presence” or FoP, and it’s been reported all around the world. Although it can be experienced by people with healthy neurological functions, FoP is more prevalent in people with certain neurological or mental health problems. Neuroscientists in Switzerland studying the phenomenon believe that they have pinpointed three areas in the brain responsible for FoP – and they built a robot to simulate the creepy feeling. The researchers first studied the brains of 12 patients with conditions like brain tumors, epilepsy, migraine, and stroke. The patients all reported experiencing FoP regularly. They observed the subjects’ brains as they experienced the phenomenon and identified three damaged areas believed to be responsible for the weird feeling: the temporoparietal, insular, and frontoparietal cortex. They were then able to give healthy people that same bizarre “feeling of a presence,” an experience that left two participants so weirded out they just walked out on the experiment. The scientists recreated the FoP by analyzing the sensations experienced by the subjects having actual FoP episodes. They noticed that if the person having the experience was seated, they would perceive the “presence” as also being seated. The researchers discovered that the feeling of an unknown presence actually originates from the brain’s confusion over the signals of the person’s own body movements. The affected person’s brain doesn’t realize that these movements are coming from their body, so they attribute the odd sensation to another presence being in the room. 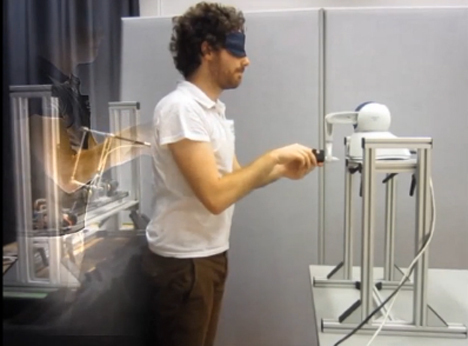 Armed with this knowledge, the researchers created a machine that would purposely confuse a person’s sensorimotor signals – the signals your body sends to your brain when you move. 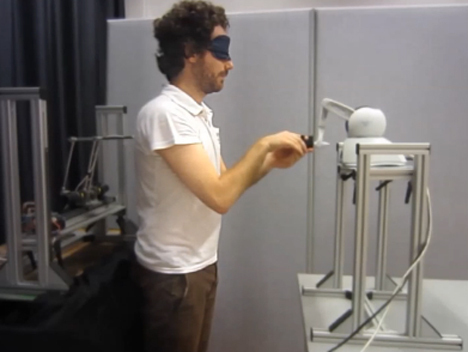 Subjects were blindfolded and then directed to push a lever. 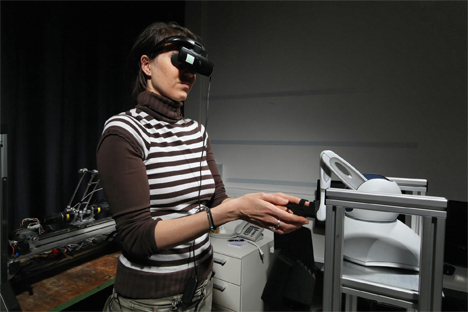 In the first part of the experiment, pressing on the lever caused an object behind the subject to poke him or her in the back. This was confusing because it felt like subjects were reaching forward but their movements were being felt from behind. But in the second part of the experiment, researchers messed with the subjects a little more. This time, the poking was delayed by a second or two. Although the subjects knew logically that they were causing the poking sensation, the delay made it seem like someone else was responsible. It was because the expected reaction to the subjects’ action was mismatched, causing a kind of temporary disconnect in which subjects reported feeling like there was someone else in the room with them, poking them in the back. The researchers explained that the same temporary confusion occurs in otherwise-healthy people from time to time, which explains why we sometimes just get that creepy-crawly feeling like we’re not alone in an empty room. See more in Weird Science or under Science. November, 2014.